I run. 5ks. Exclusively. And infrequently. Like twice a year. Quick synopsis of the movie. JTT is a college kid, or maybe he’s at a fancy boarding school? He’s also the worst and the only way his dad can convince him to come home for Christmas is to bribe him with a very expensive looking car. But he has to be home by Christmas Eve. Also, Jessica Biel is there. The car thing really erks me. Go see your family, JTT. When I came home from college for Christmas I had the privilege of asking if I could borrow the Dodge Intrepid. And I had better gas it up. And pick up milk on the way home. Jonathan, didn’t Tim the Tool Man Taylor teach you anything about respect? Gosh. In any case, the best part of the movie is when JTT enters into a Santa 5k in an attempt to win some money for a bus ticket. (He lost his wallet probably? Maybe sold it for some magic beans? Maybe I was getting a snack during this part?) I love this scene though because it looked like so much fun to see a bunch of fully outfitted Santas running down the road. 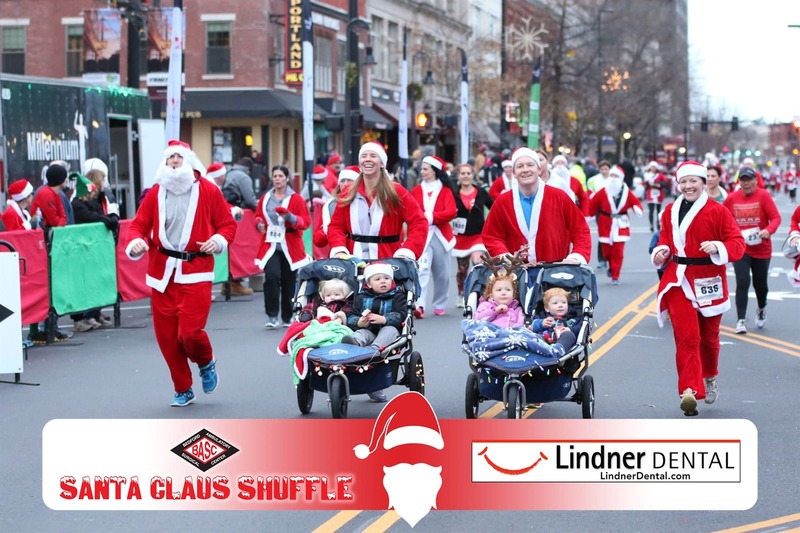 So when given the opportunity to participate in the Millennium Running Santa Shuffle 5k in Manchester, NH seven years ago I was ALL IN. The fact that I don’t really run. The fact that the three people I was running with were college athletes and marathon runners. Whatever, it was fine. 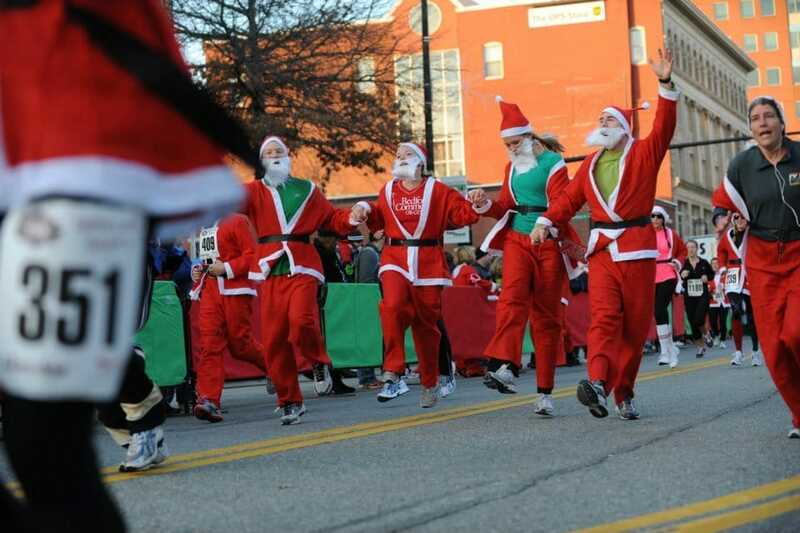 Because in all honesty you can’t run all that fast in a felt Santa suit. And running down the street with 200 other people in full Santa gear while the kids watching LOST THEIR MINDS with excitement was awesome. There was a parade directly after the run on the same street so we took the opportunity to walk up and down the parade route spreading the magic of Christmas with our Santa-ness. It was at that moment that the four of us committed to participating in the Santa Shuffle 5k until the end of days. And we’ve kept the commitment, for seven years straight. 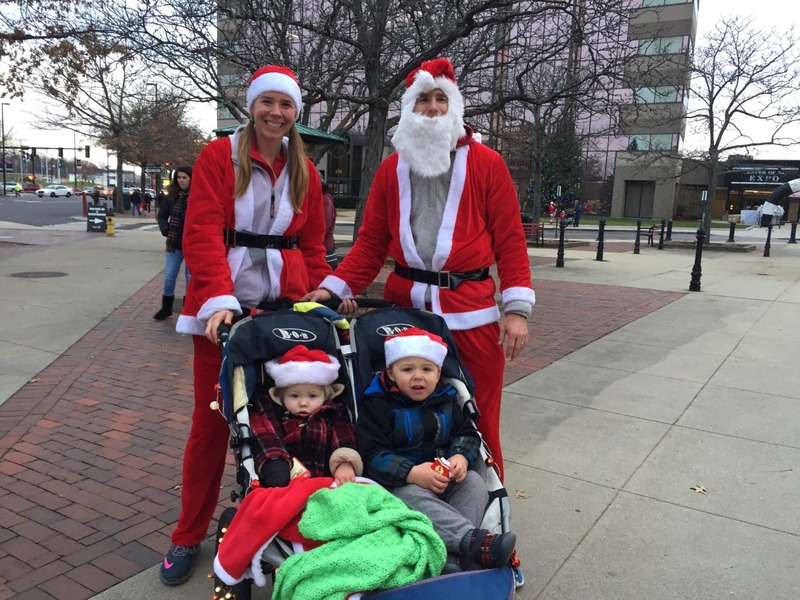 The Millennium Running Santa Shuffle 5k has now grown to over 1,500 Santas participating, so it just keeps getting better as we get older and slower. To be transparent, there were a few years in the middle that we had to walk the 3.1 miles because our friend Christina and I spent the better part of three years in the family way. But now that all four kids have been birthed we are back at it going full moderate speed. With two double strollers. And this year the strollers had lights! Oh, and while we are being transparent, let it be known that the day after I run in any 5k I am gingerly walking around my house like I’ve just been through a particularly vicious session of medieval torture. My thighs! MY THIGHS! The things we do for friendship. And Christmas. And the post-race pizza. What a fun tradition! My family always goes to see a movie the morning of Christmas Eve. I have no idea how it started but I bet it’s so that the kids were out of the house and wouldn’t constantly ask about Santa or when we would get presents. We still do it to this day and the youngest will be 17 this year! I love that! What are you going to see this year? I’m not sure yet! Last I talked to my mom, she said two potentials are “The Greatest Showman” and one other but I can’t remember it. I’m sure we’ll decide on the 23rd once everyone gets to their house. Thank you! And we will! It’s on the books for years to come. Lol that sounds like so much fun! What a fun tradition! I love that you have kept it going for so long! Until the end of days! Hope our kids like to run because they are coming with! Loved this tradition, looks so much fun! enjoy! This makes me miss running 5k’s with my friends, we used to run a Turkey Trot every year on Thanksgiving, but now we all live in different parts of the country. 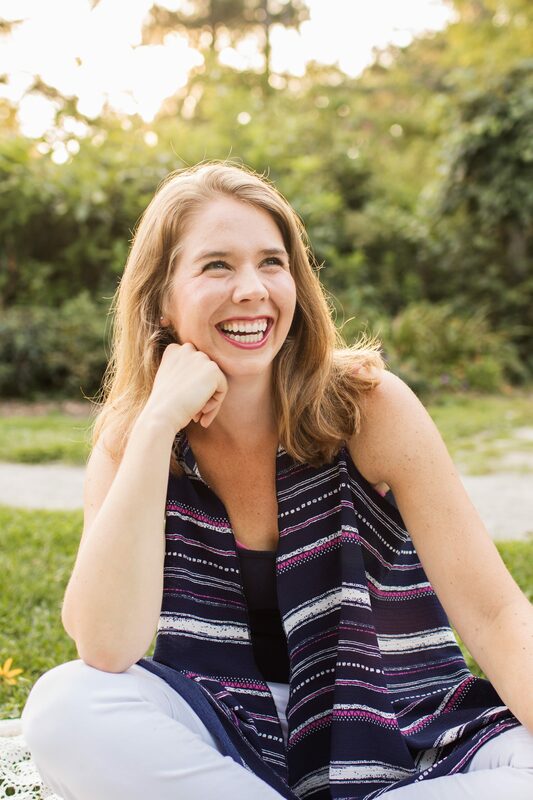 Your writing is so genuine and funny, your personality really shines through and it makes it so fun to read! And thank you so much!! You just made my day. I’m glad we connected!